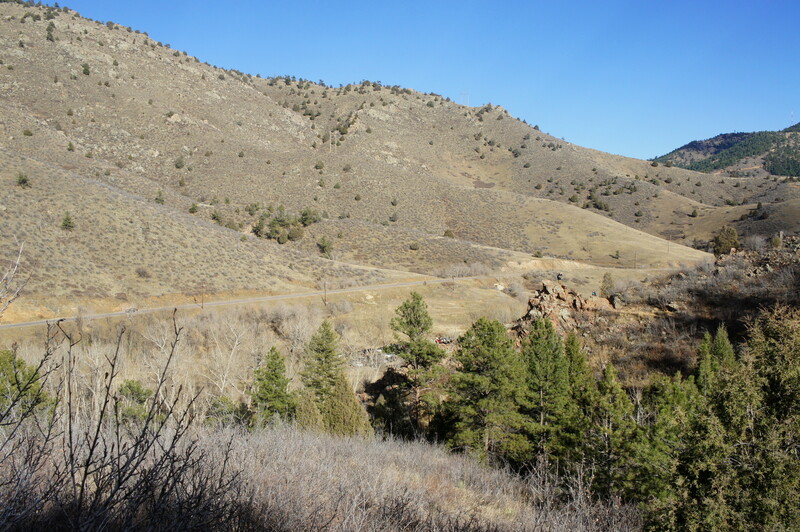 Gaining 180 feet in elevation, the Bruin Bluff Trail is a slightly more difficult alternative to the Bear Creek Trail in Lair o’ the Bear Park, roughly five miles west of Morrison, Colorado. 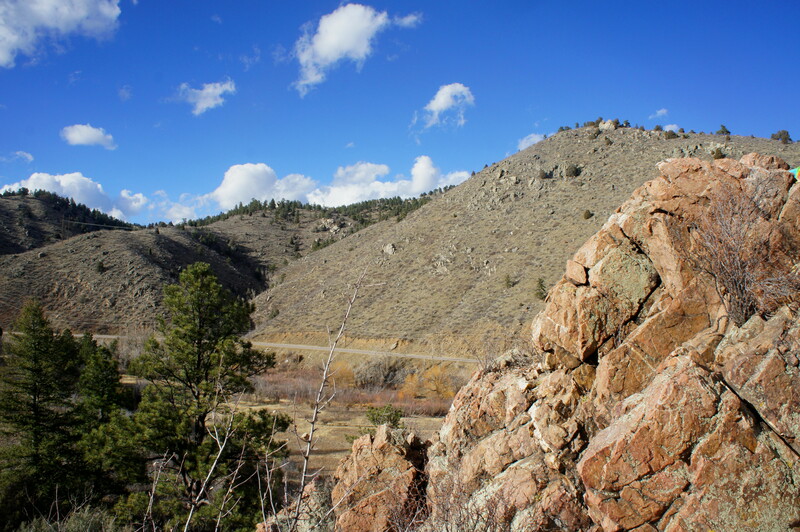 Climbing in and out of mostly spruce forests, the meandering path provides views of a sun-soaked valley in Colorado’s Front Range, including from the trail’s namesake bluff, a top destination for hikers in this popular park. 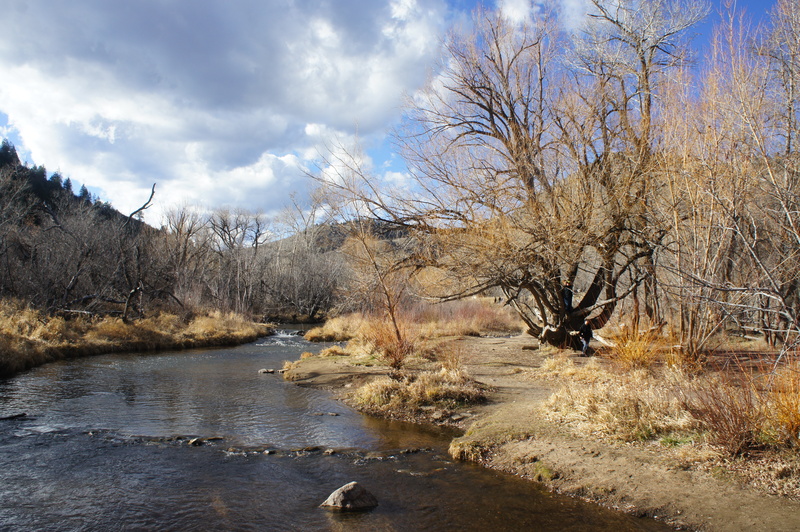 The circuit hike twice crosses Bear Creek, a lovely stream that gives life to large cottonwood trees. 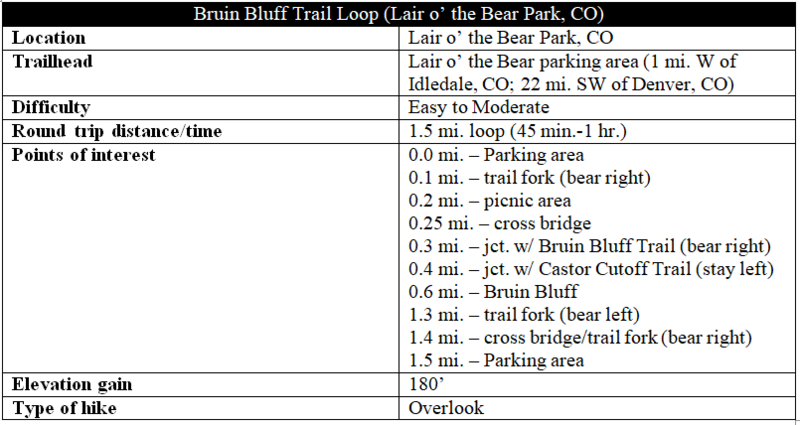 The Bruin Bluff Trail Loop begins and ends at the main parking area in Lair o’ the Bear Park. Arrive early or late in the day to avoid the crushing crowds, as this small but popular park can draw hundreds of visitors per day from the nearby Denver metro area. There are effectively two wide and well-trodden paths that begin at the parking lot: start with the trail heading east, heading across an open field past the pit toilets. This is technically part of the Creekside Trail, which merges with the Bear Creek Trail at 1/10 mile. Follow the hard-packed thoroughfare for about ¼ mile to a shady picnic area on the banks of Bear Creek, which feeds into the South Platte River several miles downstream. Here a set of craggy cottonwood trees hug the banks, with hefty branches extending from their huge trunks. Cross the Ouzel Bridge to the south side of the creek. From here, the trail runs up against the base of a tree-laced mountainside. Bear right at the fork at 3/10 mile. This is the start of the Bruin Bluff Trail. Now bearing west, the Bruin Bluff Trail begins to gradually climb through deciduous and coniferous forests, eventually approaching a grassy hillside, where the trail forks, at about the hike’s 4/10 mile mark. The trail bearing right is the dusty Castor Cutoff Trail, which provides a shortcut to Dipper Bridge to the northwest. Stay left on the Bruin Bluff Trail, which continues to climb after the junction. 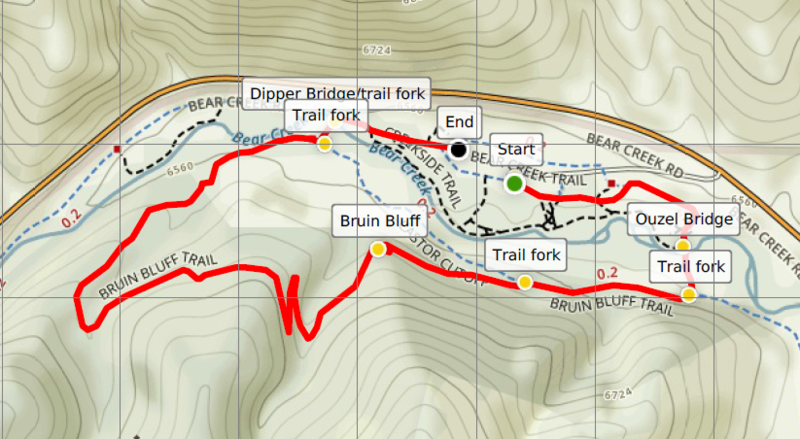 Now out in the sunshine, the narrow path climbs abruptly up a set of short switchbacks, then reaches Bruin Bluff. From this rocky promontory, hikers have near-panoramic views of the valley below. 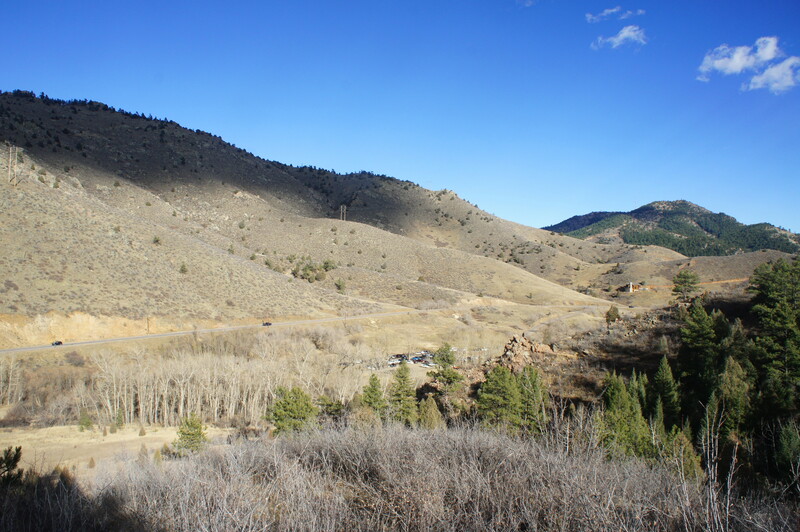 The mountains to the south, across Colorado Highway 74, rise to 7,800 feet and are situated outside the park boundaries; to the east, tree-covered Mount Morrison (7,881’) guards the entrance to Bear Creek Canyon, with Denver and the vast, endless plains beyond. 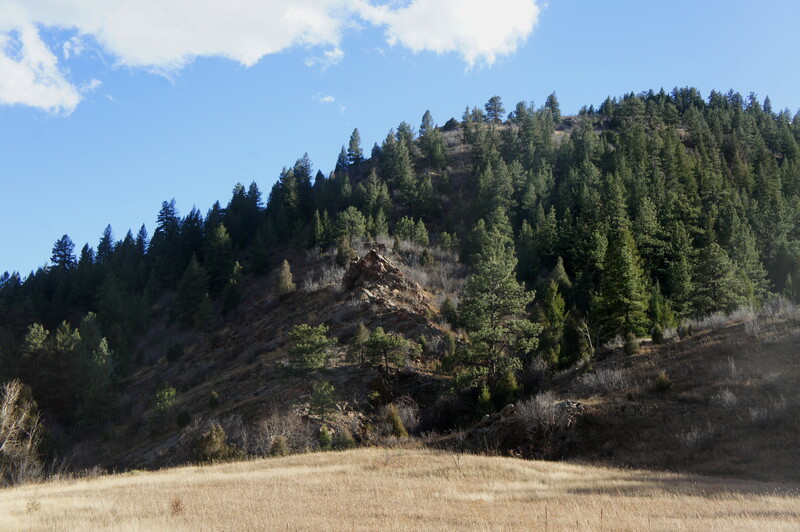 The valley through which Bear Creek cuts is curious for its contrasts: while the south side (where you are hiking) is blanketed with evergreens, the north slopes are nearly bare of vegetation—likely a product of differing wind and soil conditions. Even as you have reached Bruin Bluff, there is much more hiking to complete, and some of the best—and higher—vistas are to come. From the lookout, the trail cuts southwest and clears a minor, wooded ravine. At about 7/10 mile, the path switchbacks through upland scrub and offers the hike’s best views as Bruin Bluff remains visible across the gully. From here, hikers will bear west through a dense conifer forest, reaching the highest point of the loop at around 9/10 mile. The rest of the hike is a slow and gradual descent, first through thick woods, then down an exposed ridgeline. Coming within striking distance of Bear Creek, the trail cuts across a grassy meadow at around 1.25 miles. Bruin Bluff is now visible again, this time up above to the south. At 1.3 miles, bear left at the trail junction and immediately cross Dipper Bridge. Bear right on the Bear Creek Trail, the busiest walk in Lair o’ the Bear, and follow it for 1/10 mile back to the parking area. Allot between 45 minutes to an hour for this short and relatively easy loop hike in the Front Range. Head west on the Bear Creek Trail as it enters a narrow canyon and passes high walls, whitewater rapids, and a curious modern-day castle en route to Corwina Park. 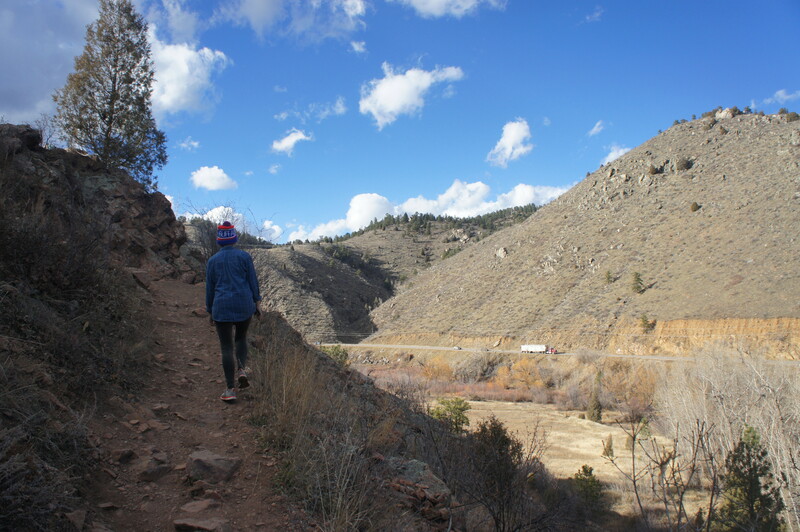 This entry was posted in Colorado, Easy Hikes, Jefferson County Parks, Moderate Hikes and tagged Bear Creek, Bear Creek Canyon, Bear Creek Trail, Bruin Bluff, Bruin Bluff Trail, Colorado, Creekside Trail, Denver, Idledale, Lair o' the Bear Park, loop hike. Bookmark the permalink.